Some players have criticized the Crash Bandicoot N. Sane Trilogy for introducing extra difficulty into what were already tough games and now the developers have responded. An official post on the Activision blog lays out Vicarious Visions' plan of action for helping disgruntled players have a better time with the trilogy remake. Step 1: Get better at Crash Bandicoot N. Sane Trilogy. That's all the steps. "Now, we can all agree that some of the Crash levels were, and still are, not easy," the blog post explains. "The challenge of the games is one of the things we all love, and that’s why it feels so, so good when you beat them. Our goal for the Trilogy was to reduce any points of frustration while preserving the challenge of the originals, and we feel we’ve done that." The revised checkpoint and save systems definitely do a lot to reduce the usual retro-game friction. But players have called out new jump physics that make Crash fall slightly faster, a too-precise collision system that makes it much easier to fall off of narrow ledges, and other new problems that have pushed the N. Sane Trilogy in the opposite direction. 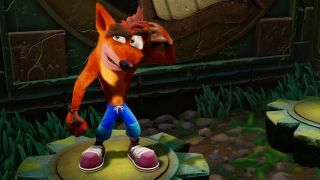 Vicarious Visions admits that its modern collision and physics systems mean "certain jumps require more precision than the originals" but adds that it worked hard to make sure the design was both fair and faithful to the originals. "An increased precision is now required in the first game, which makes the gameplay experience different. Particularly if you are a new player, you may want to start with the second and third games first, and then come back to try Crash Bandicoot after you’ve had more practice. For those of you who played the originals and acquired a fair amount of muscle memory, re-learning the handling in our game may present an additional challenge you weren’t expecting. But we’re sure you up to the task." I admire a developer that is willing to stick to its guns, but let's be real: "we're sure you're up to the task" is just the nicest possible way to say "git gud". Make sure you read our Crash Bandicoot N. Sane Trilogy review for our take on the game.